That’s also why there are various names and different diagrams, although similar, for just one flower. lotus’ flowers | 蓮の花/ はすのはな. Diagram in portuguese and japanese (translated from jp by me). Quite understandable even if you don’t understand japanese. The diagram for these flowers is from a gift to a friend of mine. 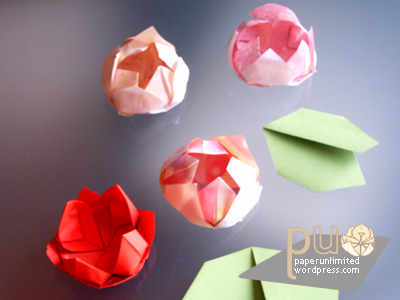 There’s a little secret in how to make these flowers: you have to hold and adjust the paper while pulling the petals. If you don’t the paper tears. My first flower had only two petals in one piece the rest was all thorned up but at least i understood how to make them :) This trick also applies to the water lily. Water lily | 睡蓮/ スイレン. The diagram is from a MOMOTANI Yoshihide (桃谷好英) book. If you don’t open the petals all the way (yellow water lily) it becomes even prettier in my opinion. The leaves also came from this book. 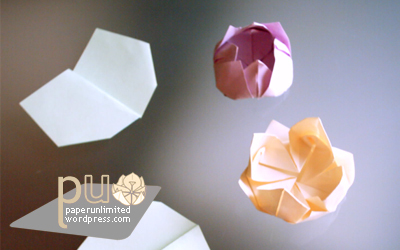 This entry was posted on 2007|01|30 at 09:47 and is filed under origami. You can follow any responses to this entry through the RSS 2.0 feed. You can leave a response, or trackback from your own site. Adorei pena que não tem o diagrama e sou muito nova nessa arte. Se possivel mande para meu e mail.